You are supposed to report any incident whatsoever to your employer, personal vehicle or no. And even if you weren't supposed to it doesn't make /any/ sense to let them figure it out. Own your ****up and tell them first. The thing is, it's not like you have two licenses. You have one. Anything attached to that license is reflective of who you are as a driver. This is why a company wants to see, even if you have items on your record, no /new/ incidents for "x" amount of time. It shows a change in behavior. If you're already suitably employed, stick with it, put your effort into making sure you're not let go when they find out what happened, and focus on keeping your nose clean. Another thing too.. idk maybe you have driven as much as me or maybe not. If you have you should know the company itself does not determine or have the final say on if you go or stay. I am 100% positive if the final say was left to my employer right now... I would not be let go. But at the end of the day, the final say goes to insurance. My question isnt so much as what company would hire me. With my experience and no ticket, violation, accident, etc as not been in a cmv, I guarantee you no company would turn me down. But it's the insurance that's truly runs the trucking business or at least with most places. All these driver requirements in most jobs like years of experience, or no more than this many violations in a period of time, that comes from insurance. I do not know what company you work for and that's irrelevant anyways. But company police and actual law is two different things. Alot of companies in their employee manual will state you have to report all accidents even in personal vehicle. But company policy usually goes above and beyond federal law. The fmcsa is what we truckers go by. It is are definite law for truckers. I dont plan on staying with this company bc I get (in nearly a years time period) 8 hours less than what was promised. I get paid hourly so it's about 12000 worth I'm getting paid less. To me that is not acceptable. Now grant it I'm use to doing food service. The company im with now is ltl... maybe I should slow it down some but that is just not who I am. I do twice as many stops as most drivers that I work with. And yes that could be a big reason why I don't get as many hours but again I'm a go getter type of person. I dont even take an official break. If I'm at a stop for 50 mins... that is my break to me. Cause I literally do nothing for those 50 mins besides pro label some stuff and sign some bills. So once again I ask. Idc about company policy only what's in our fmcsa book. If anyone knows where it is law I have to report any accident, even personal and no ticket issued, then please point me in the right direction in the fmcsa book itself. Was a police report filed? Was your insurance company contacted? If “yes” to either of those questions, you must inform your company because an official record exists documenting the incident. Do you know of where to look in the book for it. The reason I ask is because doing some research there is mixed answers between drivers and trucking sites alike. In Section § 383.31: it states you have to report in any vehicle a traffic violation (broke the law) in which the holder of a cdl has to inform their employer. Again I got no ticket and of course this was a personal vehicle. I understand in an cmv you would have to report it but I was not in a cmv. If you or anyone could point me in the direction where it states I have to report any accident cmv or not, then please do so. I will probably take time in the next few days to look over the book again and see if I can find it there. But using the fmcsa website all I find is about what I talked about above. My intentions is not to break the law but also be cautious in my next steps moving forward. If you're looking at food service check out Performance Food Group (PFG). I cant tell ya for sure that they'd hire you but in my area they hired a guy who fell asleep behind the wheel and rolled a truck at previous company, and kept a different employee around until he rolled a truck after falling asleep a third time. I cant say for certain they'd hire you but perhaps its worth checking out. They're hiring in Greensboro for a driver paid hourly under the "Vistar" brand. I saw that man but wasnt sure how strict they were. I knew mdi was strict, and IFH was owned by Alex lee (before pfg bought them) who also owned mdi. I'll look at applying for them. Appreciate the comment. Nah as far as I know the law states that moving violations once convicted you have 30 days I believe to report it to your employer. But it doesnt state accidents. I never got a citation for the accident because the cop never was there nor did he even go to see my cars damages. I asked him to just to see that I had some damage from the rear of my vehicle and so I can show proof of what I was saying but he never did. Nor did he mention a 3rd vehicle in the report. Maybe I should've just not picked up the call but I did and I was honest with him. Actually I don't know that they would. Well from what I read there requirements as far as accidents is no more than 2 major accidents in 2 years for swift. And supposedly the person I hit had all this damage done and tried to say I ran from the scene. This is the second person in two days that did absolutely nothing wrong but is getting screwed by the police and other people they supposedly never wronged. Incredible how that keeps happening to certain types. I suggest sticking with the company you're working for and hope they keep you around. No one is going to be able to justify hiring you to their insurance company with your recent record. I know it probably sounds crazy, but if you're going to make a living driving you should probably be a responsible, cautious driver. It's amazing how much that helps with your driving career. Well that's why I am here asking. Honestly the company I interviewed for the accident happened afterwards. I am truly hoping they already checked my record before the accident. If so I wont have to worry for another year. After making 90-100g that year, I think I could manage especially considering that the ticket and first accident I was truly at fault for would be past the 3 year mark. But If they haven't checked it yet then they do and see this new accident, then I guess it's just up to the insurance to say yes or no. They say no I'll keep this one long enough til I get let go of or find another one. And btw yes it was my stupidity that didnt get pictures and etc. Although the accident wasnt truly my fault, me being a driver and not even thinking about taking pictures in a personal accident was not wise on my part. I'm not above doing what's needed. So, why not stay where you are? I'm sure it must be much better than Swift. You already seem to know which companies are desirable. It's no surprise how you follow the ignorant masses in your disdain for one of the most successful trucking companies on the planet, but it surprises me you're asking us for recommendations since you've already got most of this stuff figured out. By the way, since you've never worked for Swift, how about giving us a break and save your criticism for something you actually have some first hand knowledge about. One of our first rules in here is "B.S. gets called out." I parked yesterday next to a Swift Driver - his truck was emblazoned with decals indicating he had 7 million safe miles with Swift! I guess someone forgot to give him the memo about how bad a company they are. The problem here seems to be your driving record. Did Swift have anything to do with that? I suggest you figure out how to be a better driver and get off your "high horse" about companies being beneath you. I'm just kind of like that though. I've always considered a driver's success to be bound up in his own performance. Trucking Is A Competition Between Drivers. It's unfortunate how you see it as a competition that's based on the name displayed on the truck. Hopefully you'll hang around with us long enough to figure out how to put in the effort it takes to become a Top Tier Driver, of course that will mean you're going to have to break down all of the stereotypical thinking that has hindered your career this far. What do you think? Can you set yourself free and make some progress as a professional driver? It's all up to you at this point. I've tried to lead you to the water... It will be up to you to take the drink. Hey for one I wasnt downing any driver or company. But thanks for insulting me. When you think of swift, prime, us Express, etc. You think of otr. Majority of their drivers is otr. I dont care to do otr because I can make as much money being home alot more. 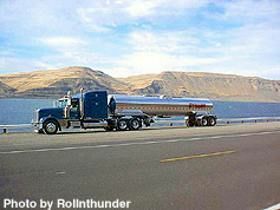 My first job was flat bed and otr.. it was McElroy. I consider that a less desirable job although I loved how I was treated. Just wanted to be home more. My reasons for wanting to leave the company I'm currently at is my reasons. But if I dont within the next 6 months they'll check my mvr again. They'll see that accident, they'll investigate, and there is a possibility I could be let go because of insurance. It's better to know my options 6 months in advance than wait until the last month. I hate that to you're standards I am not a top tier driver. Although for the 5 years I've driven, I have not ever got 1 violation (DOT), never got a citation, never in a accident, never even had a backing accident, and never failed or got a violation on an inspection while driving a truck. Yes I drive my personal vehicles or have in the past worse than I would in a truck. Now I don't. Did I tell you that my last accident really wasnt my fault. Basically to shorten it, no to minimum damage was done to anyone vehicle. Someone hit me from behind. I had some distance and let of the brakes so that the guy behind me didnt destroy my car. That push was just enough that I couldnt stop before the next car. If I didn't let off my brakes I could be injured right now considering I was in a Honda civic and the guy that hit me was in a Toyota Tacoma. Basically I didnt take pictures bc I was worried about getting off the interstate since I was at a bridge, and we all agreed to just go and not call the cops. Cops called me 3 hours later and wrote a report and basically said bc I have no proof the other vehicle didn't exist. And supposedly the person I hit had all this damage done and tried to say I ran from the scene. But again does anyone know of desirable jobs (home most everyday, decent pay. For ex: food service and/or ltl. Ltl like old dominion, food service like us foods), that you believe would still hire me with my current situation? So basically I have 1 moving violation that's a little over 2 years, a at fault accident that's 2 years old, and one I recently got. I kinda screwed myself on the last one bc it really wasnt my fault and I could explain why but what good would that do? Anyways, for those in situations such as myself, or for anyone that just wants to give their opinion or facts, how hard would it be to get a good driving job now. I am currently employed. I have not reported this to my employer because legally I am not required (only convicted citations are required). But I recently interviewed for another job. Food service to be exact. I have had my cdls for 5 years. Never been in a cmv accident. I know places like swift will hire me, but that's not most desirable. If I got to in the end then I got to. I'm not above doing what's needed. So again my question is anyone know if there's any chance a more desirable driving company would hire me still?